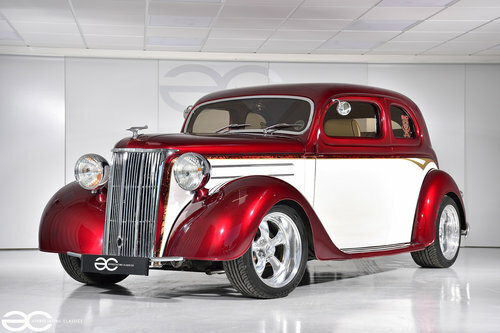 Here is something a little bit different for you….. A Ford Pilot ‘Street Rod’ with a Small Block Chevy V8! Built over the course of 2 years by a well renowned specialist, with things such as a 2dr conversion, roof chop, shaved doors, custom interior, extended arches and some superb paintwork this really is about as individual as they come! As if this would not grab peoples attention enough, the car is of a high specification with a claimed 330bhp and a simply incredible noise, this is sure to turn heads wherever it goes. All of this whilst travelling in a professionally custom built and trimmed interior which looks absolutely superb. Only 549 miles have been covered since the build of this vehicle, and it truly deserved to be used and enjoyed by an enthusiast. 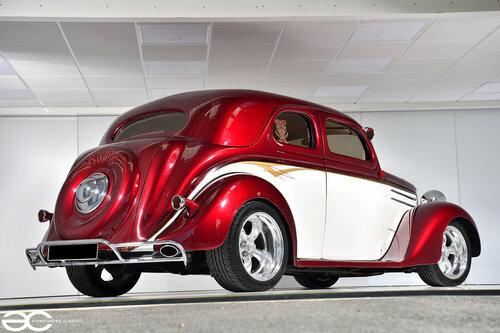 A seriously vast history file is with this 1950 Ford Pilot as you would expect. Around £70,000.00 in receipts for the 2 year build, the specification is very high and is far too much to list within our listing but we will do our best. 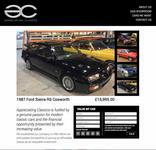 Built by a well known specialist in Great Yarmouth – S.I.D. (Specialist in Design) over the course of 2008 and 2009. Pictures of the car prior to the major rebuild are also within the history file, showing that it was already in good order, attending shows, and was not a poor condition vehicle to start with. Since the build, this vehicle has only had little usage and in good weather only. A little tinkering of some simple bits will see this car back out at the shows, drawing the crowds. 2 door coupe conversion, with a roof chop, body drop and shaved doors make this a real head turner. The bodywork was done to a very high standard, and incorporates custom steel running board conversion with bead rolled swage lines. Custom rear lamp brackets, custom bumpers both front and rear, along with extended rear arches and a flush fuel door. The beautiful custom two tone Brandywine Candy and Alabaster Pearl colour scheme really sets this car apart and is still in great condition with custom airbrush and hand striping detailing. 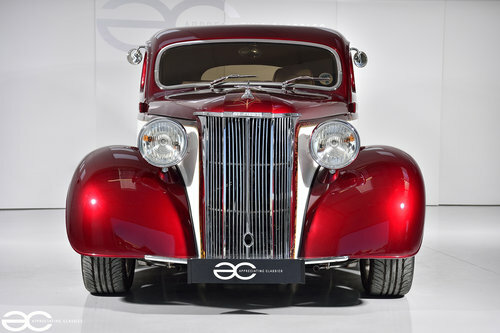 Receipts for all works carried out are present, and show every detail, such as the headlamps being fully restored at a cost of £850.00, and all the chrome work was done professionally at the time of the build (the grill alone was £500.00 to have chromed). Starting to show some signs of age in places, but all easily put right with minimal costs and effort. In fact we can look after any changes you may like at an extra cost. 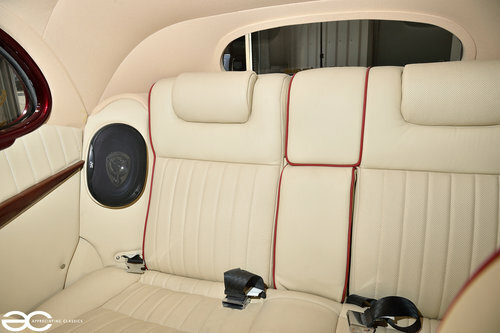 A fully custom interior compliments this Street Rod perfectly, utilising the very comfortable Rover 800 electric front seats, with a modified Granada rear seat, the headlining, doorcards and carpet are all custom items, all of which have been done to a very high standard. A custom dashboard is in place, which has been finished in the same Kandy Red as the exterior, with the hand striping to match. Moon eye gauges have been used, and push button start along with matching push buttons for the door opening and trunk release. 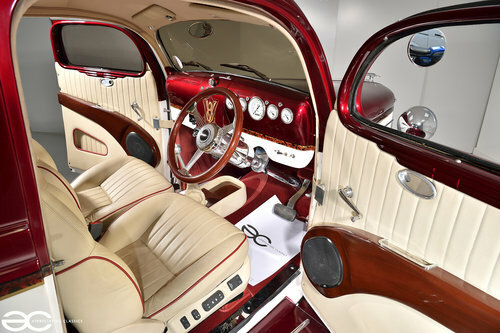 A real ‘Hot Rod’ feel about the interior, and a high class finish throughout. Whilst being built it was decided a new Chevrolet 350ci (5.7L) V8 crate motor was the engine of choice. The specification includes Edelbrock heads & manifold, with a 4 barrel Holley 600cfm carburetor along with a performance camshaft. A power is quoted of 330bhp, and a custom stainless steel exhaust system all the way through makes this Hot Rod sound absolutely incredible! The transmission of choice was a R700 T4 automatic 4 speed transmission with overdrive, with a street converter torque converter, a transmission cooler kit, B&M Street Rod Shifter and a custom propshaft. 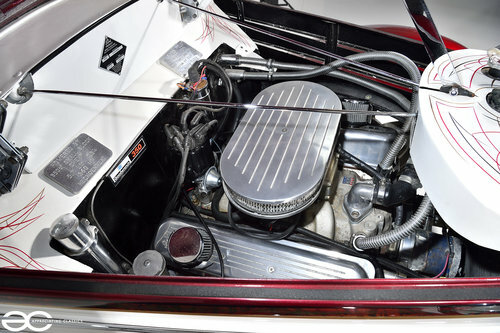 The engine bay itself presents well, with various parts having been chromed at the time of build, along with the obvious expensive polished aluminium items. All of these present well, although with it being 10 years since build, they could do with a re-polish to get them shining like new again if you are super fussy. Obviously with such extensive works, the chassis and running gear have not been overlooked. The chassis has been modified and strengthened chassis by S.I.D. with the main modifications being to the front chassis rails to allow for the Wisbech Engineering independent front suspension set up. 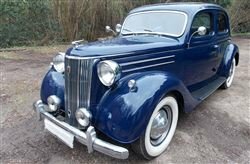 A lockheed power servo was fitted, and Ford front disc brakes have been fitted, with the rear brakes also being a disc set up from a Volvo. This leads us nicely to the rear axle which is also from a Volvo and the rear suspension which uses the same Pro Tech adjustable shocks as the front. 17&#8243; Torque Thrust 2 wheels were fitted, and are without any damage.